Habit: Annual, perennial herb, unarmed. Leaf: generally palmately compound; stipules conspicuous, partly fused to petiole, generally papery or membranous; leaflets generally 3, occasionally 5--9, +- toothed or wavy. Inflorescence: raceme (generally umbel-like), head, or spike, axillary or terminal, generally many-flowered, generally involucred, generally peduncled; inflorescence bracts 0 or forming vestigial ring or involucre; flower bracts present or not. Flower: generally spreading to erect, generally becoming reflexed; corolla generally purple to pale lavender, occasionally yellow, persistent after flower; 9 filaments fused, 1 free. Fruit: generally indehiscent but generally breaking, short, plump, generally enclosed in corolla; base generally stalk-like. Seed: 1--6. Habit: Annual, hairy. Stem: decumbent to erect. Leaf: cauline; stipules small; leaflets 1--3 cm, oblanceolate to obovate. Inflorescence: spike, 5--20 mm wide, ovate to short-cylindric. Flower: calyx 4--8 mm, lobes 3--6.5 mm, > tube, tapered or bristle-like, plumose; corolla 5--8 mm, <= calyx, 2-colored (purple and white). Seed: 1--2. Chromosomes: 2n=16. 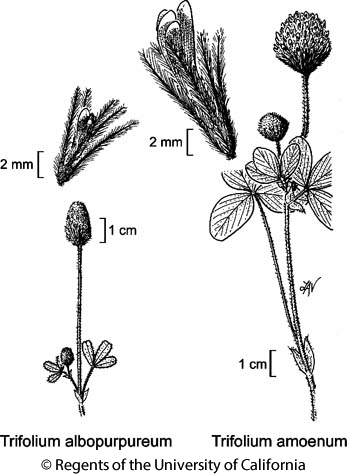 Citation for this treatment: Michael A. Vincent & Duane Isely 2012, Trifolium albopurpureum, in Jepson Flora Project (eds.) Jepson eFlora, http://ucjeps.berkeley.edu/eflora/eflora_display.php?tid=47029, accessed on April 20, 2019. CA-FP; Markers link to CCH specimen records. Yellow markers indicate records that may provide evidence for eFlora range revision or may have georeferencing or identification issues. Purple markers indicate specimens collected from a garden, greenhouse, or other non-wild location.